By the time you’ve made it to the end of a busy year and the holiday season arrives, you’re ready to let your proverbial hair down and delve into the delights that surround you. 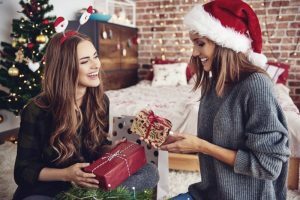 While being able to eat your favorite foods is a big part of the allure of the holidays, the last thing you want to do is encourage poor oral health. These 5 tips will allow you to enjoy the festivities while protecting your mouth, teeth and gums. With anything, there need to be limiters in place to prevent excessiveness. Such is the case when it comes to your holiday food intake. Although it can be difficult to turn down extra servings of your favorite delights, it is vital to your oral health to have a limit in place on how much you will consume. This affects your dental wellness in that constant eating can lead to excessive bacteria accumulation. As a result, you’re left more vulnerable to developing tooth decay and gingivitis. Drinking the right amount of water is necessary for maintaining a healthy state inside your body. More specific to your oral health, though, it helps to saturate your mouth after a meal to aid in flushing away the remaining food particles. Brushing – To get the best results from brushing your teeth, be sure each session lasts at least two minutes. Using soft bristles to protect your gums from irritation, gently clean all the surfaces of your teeth after a meal to remove the majority of the debris. Flossing – Unfortunately, there is only so much that can be cleaned with a toothbrush. Dental floss helps to remove the remaining 40% of food particles that rest snuggly between your teeth. So by keeping a toothbrush and dental floss handy, you can go ahead and enjoy that slice of pie, knowing that once it’s digested, you’ll be clearing away the excess sugar. Above, it was suggested that you place a limit on how much food you eat. Along with that, you should be more selective about the types of items you consume. For example, if you are eating dessert treats, it’s better to choose those made from dark chocolate because it typically contains less sugar and is easier to remove from your teeth. A final way to maintain excellent oral health over the holidays is to visit your dentist for preventive care. These appointments typically include X-Ray photos (if it’s your first visit), a cleaning and an examination. Therefore, you can go into the holiday season fully aware of the condition of your oral health, and you’ll have beautiful “pearly-whites” to flash for the cameras! Dr. Richard Fossum earned his dental degree from the University of Texas Dental Branch in Houston, and he has been practicing in the Temple area for the last 14 years. Dr. Fossum helps patients maintain excellent oral health over the holidays at Fossum Dental Group Dentistry. He can be reached for more information through his website.